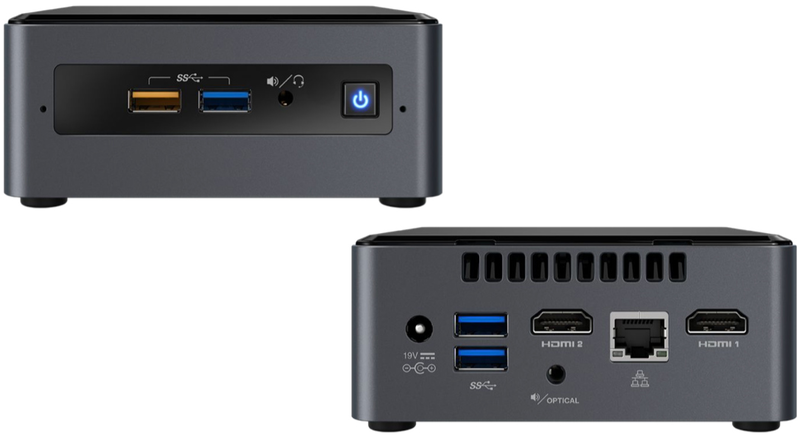 SimplyNUC, a retailer specializing on SFF PCs, has started to take pre-orders for Intel’s NUC8i3CYSM and NUC8i3CYSN ultra-compact form-factor PCs (codenamed "Crimson Canyon"), which are based on Intel’s Cannon Lake processors. The new systems are outfitted with AMD’s discrete Radeon 540 graphics processor and are the first Intel NUCs to feature a fully discrete GPU on a separate chip. The retailer belongs to Intel’s Platinum Technology Providers, so the pre-sales are all but official confirmation of the products and their specificaitons. The Intel NUC8i3CY-series UCFF PCs come in traditional 4.6-inch × 4.4-inch form-factor and are based on Intel’s dual-core Core i3-8121U processor accompanied by AMD’s Radeon 540 dGPU (codenamed Lexa, based on Polaris architecture, featuring 512 SPs) with 2 GB of GDDR5 memory. The systems come with 4 GB or 8 GB of LPDDR4-2666 memory, all of which is soldered down. By default, the NUC8i3CY-series are equipped with 1 TB SATA hard drive, but there is also one M.2-2280 slot for a SATA or a PCIe SSD. It is noteworthy that Simply NUC's documents covering Intel's NUC8i3CYSM and NUC8i3CYSN UCFF PCs do not explicitly state the processor the systems use is the Core i3-8121U, which belongs to the Cannon Lake family and is made using Intel’s 10 nm process technology. Still, the papers say that the chip in question belongs to Intel’s 8th Gen of Core i3 U-series products, they disclose its core count, base and boost frequencies. Meanwhile, the only dual-core Core i3 8000U processor clocked at 2.2 – 3.2 GHz is the Core i3-8121U. It also lacks iGPU, which is why the NUCi3CY-series PCs need a dGPU. By contrast, its 14-nm brethren — the Core i3-8130U — features 2.2 – 3.4 GHz frequencies and has an iGPU. When it comes to performance, Cannon Lake has its perks, such as AVX-512 support, though they may not be that obvious in the SFF space as they are in the HPC/HEDT space. Evidently, AMD’s Radeon 540 should also be faster than Intel’s UHD 630 Graphics in games, but keep in mind that when it comes to media playback Intel’s contemporary iGPUs have certain advantages over AMD’s Polaris (e.g., VP9 10-bit decode, support for sophisticated copyright protection methods that require Intel’s SGX, etc.). Back to the systems. Both NUCs are outfitted with Intel’s Wireless-AC 9560 CNVi 802.11ac Wi-Fi + Bluetooth 5 solution that supports up to 1.73 Gbps throughput over 160 MHz channels. In addition, the systems have one GbE, two HDMI 2.0a outputs, four USB 3.0 Type-A ports (one supporting charging), an SD card reader, a TRRS audio connector for headsets, and a digital audio connector for 7.1-channel sound systems. Time to talk about availability. SimplyNUC, a retailer that specializes on custom-built Intel’s NUC UCFF PCs, currently offers to pre-order the NUC8i3CYSN with 4 GB of memory for $529 as well as the NUC8i3CYSM with 8 GB of memory for $574. The more advanced machine is expected to ship in mid-September, whereas the cheaper model will hit the market in October. They probably have an obligation to ship 10nm parts in 2018. I was shocked to see the same thing. You'd think in 2018 a design like this would be USB-C POWERED. There might be an i5 version. As other said, there must be obligation to put 10nm CL products no matter how broken they're.